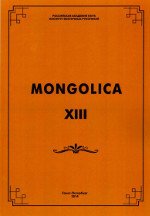 The thirteenth edition of the journal “Mongolica” dedicated to the 235-year anniversary of the birth of the founder of Mongolian studies, Russian and German scholar, academician of the Russian Academy of Sciences, specialist in the field of Mongolian Philology, history, religion - Isaac Jacob Schmidt (1779-1847). He owns more than 200 scientific articles, dozens of monographs on fundamental problems of Mongolian studies, attracted the attention of the scientific community to many of the written records of the Mongols. A large part of scientific activity I. Ya. Schmidt held in St. Petersburg. Here are his archives, among the materials which are still unpublished works, which are of great interest for the history of Mongolian. The issue consists of the following parts: “Historiography and Source Studies”, “Literature, Folklore, Linguistics”, “Reviews”, “Our anniversaries”, and “Our Translations”. The articles are written by both distinguished scholars and young researchers in the field of Mongolian studies. Reviews of new books make the issue topical. The issue will be of interest not only to Mongolists, but also to specialists in philology, history and culture, as well as to those interested in the history of the Mongolian peoples and Central Asia. This work reflects one of the periods of formation of Russian Mongolian studies - the first half of the XIXth century, which connects the names of outstanding scientists such as I. Y. Shmidt and O. M. Kovalevsky. The first works by the philology of Mongolian people, were wrote by this orientalists, the monuments of Mongolian literature, were translated by them. They cooperation in the scientific filed had become the foundation of the beginning and successful development of Russian Mongolian Studies school. Key words: the scientific Mongolian studies, I. Y. Shmidt, O. M. Kovalevsky, the Mongolian people, the science in Russia, A. V. Igumnov. Author characterizes the legal aspects of Qing Empire’s governance in Kazakhstan since the second half of the 18th to middle of the 19th cc. Author finds that Chinese authorities widely used in relations with Kazakh rulers their experience in governance of nomadic vassals, first of all, Mongols. Legal basis and administrative practice in Mongolia was transferred into Kazakhstan with all their strengths and weaknesses. Invariability of Chinese legal policy toward nomadic vassals during the ages firstly made their suzerainty attractive for Kazakh rulers but then advantages of Russian legal policy in the Kazakhstan became more clear, and Qing Empire had to loose its control over Kazakhstan to Russian Empire. Key words: Qing Empire, Mongolia, Kazakh khanates, Russian Empire, nomadic vassals, Chinese law for Mongols, legal policy. The article investgates some aspects of how the Mongols of the 13th century were perceived by foreigners, presented in the works of travelers and ambassadors from Europe and China. The article is devoted to a story of the Buddhist vision of hell, a version of The Tale of the Green Dar-ehe, which is well-known in the Mongolian literature. The publication contributes to the study of texts, dealing with the Buddhist visions of hell in the Mongolian literature. This is a publication of the first Russian translation of a work by D. Ravjaa, a Mongolian poet, public figure, philosopher, and Buddhist scholar - The Teaching of the Precious Terrible Khutagt. The article gives a short account of Ravjaa’s biography and works, and defines the place of the Teaching in the author’s heritage. This article contains information about the Praise to Bogdyn-khure spread in Mongolia at the turn of the 19th-20th centuries in oral and written versions. There is also a Russian translation of the Praise, consolidated text, based on the two manuscripts. In traditional culture material objects used in everyday life have additional, symbolic meanings. These symbolic forms define the special status and new, magical functions of a particular object in customs and beliefs. This article is dedicated to the symbolism of bones and their special functions in Mongolian traditional culture. Animal bones are used in various spheres of life, and the vast semantic field behind them classes them among the most popular objects of the Mongolian symbolic world. The bone symbolics are represented in different genres of Mongolian folklore, beliefs and ritual practices (invocation poetry and spells - dom shivshleg, practices of divination, worship offerings, funeral rituals), in everyday life, during feasts, traditional games, and so on. It is in the order of things, as cattle is still the base of Mongolian household economy, “the main jewel”. The article contains brief analysis and translation of The maγtaγal (praise) to the twelve deeds of the blessed savior Buddha, written by Galsandzhinba Dylgyrov, who was one of the main scholars of the XIX century and the second superior of the Tsugolskiy datsan. It describes the Buddha`s biography in a praise form. This work became very popular and gave birth to one literary tradition. There are a lot of works in different genres on the topic and with the motives of this biography. The letters of M. I. Klyagina-Kondrateva, who worked in the Mongolian Scientific Committee in 1926-1930, to academician S. F. Oldenburg give valuable information about the details of researches of Russian scholars in Mongolia and, at the same time, they display of the deep personal interest and direct participation of S. F. Oldenburg in the activities of the Mongolian Commission of the Academy of Sciences of the USSR, that he chaired from 1927 to 1929. On April 15, 2019, at the meeting of the Academic Council of the IOM RAS, senior researcher N.S. Yakhontova will submit her lecture Some texts from O.M. Kovalevsky's library identified in the Mongolian Collection of the IOM.